I met you last week after a rally in Kingston, NY. You were there in support of Antonio Delgado, who is running for congress in the NY 19th. I sat in the front row of the rally when you spoke. My tiny almost eight-year old daughter, Esmé, sat on my lap, and her empty purple wheelchair to our left. I held her as she wiggled and flopped forward and threw head back laughing when the crowd grew quiet. I knew you could see us. I saw that you took care to look our way as you spoke about healthcare—as if you speaking directly to me. You probably couldn’t see how teary I became when you did. Vice President Joe Biden before endorsing Antonio Delgado during a rally Friday October 26, 2018. You see, over the last two years, I have found it hard to feel as though my government knows or cares at all about our healthcare. This is a frightening prospect for any person, as we all need quality healthcare. However, in my position it is quite literally a daily matter of life and death for my child. My daughter Esmé has multiple genetic mutations which have led to serious medical complexities and severe developmental delay. She is among the costliest of healthcare consumers. She has spent months in the hospital, undergoing regular costly medical intervention and testing. She also requires nursing support overnight to help keep her stable. She fights so hard every day to stay well, and she requires a lot of people around her to help her do so. I have always believed that there are things in the political realm that are sacred, such as the basic welfare of severely disabled children. It was, after all, Ronald Reagan who was responsible for starting the Medicaid waiver system. And it is this system that supplements our private health insurance to cover co-pays, durable medical equipment, and nursing care so that Esmé can remain safely living in our home, avoid hospital stays, and not bankrupt us. However, over the last year and a half, I have come up against a very difficult truth: My daughter’s health and safety is not a priority for my representative. Knowing that Esmé’s healthcare and the Medicaid waiver programs were threatened by the Republican plan to repeal the ACA, I tried to engage my congressman, John Faso about my concerns. At the time I believed that Mr. Faso would want to hear from the parent of one of his most medically vulnerable constituents. Like many Republican congresspeople, before his vote on healthcare, Mr. Faso broke with tradition and did not hold Town Hall meetings. (He did hold a single televised, ticketed event in a room that holds, perhaps 40 audience members, that he still insists was a “Town Hall.”) So, I attempted to get a meeting with him. However, he proved to be a very difficult man to see. After months of waiting, I finally published an open letter to Congressman Faso about his committee vote and his inaccessibility, and begging him to consider my daughter before voting on the floor to repeal the ACA. It was only after the publication of that letter that I received a meeting with him. When we met, I read Congressman Faso a statement as Esmé sat with us, throwing her toys on the floor. I told him about the fact that Esmé almost died in my arms when she was three months old—going into cardiac arrest and requiring three rounds of chest compressions—and what it takes to keep such a thing from happening again. I told him about how funny and determined and clever my daughter is. I told him that my husband and I are well-educated, that he has a great job, and I had expected to have one as well after completing my PhD. But now, with Esmé, everything is different. I had to stay home with Esmé. Even with good private insurance, we need Medicaid, to keep Esmé living safely in our home. I explained that the protections in the ACA freed us, for example, that my husband suddenly wasn’t bound to a single job because Esmé’s pre-existing conditions would not threaten her access to insurance, cost, or coverage. I explained that Medicaid nursing allowed me to sleep again, to complete my PhD, to start a foundation. My congressman told me that Esmé mattered to him. He said he was working on a bill, to be passed after his vote for repeal, that would “carve out something” 330,000 medically fragile children from Medicaid caps. He told me he would put me in touch with his healthcare “expert” to discuss his bill and offer my opinion. And I did my best to trust his intentions. However, when I spoke with his “healthcare expert,” this individual had no understanding of the Medicaid waiver programs. He did not understand how cuts to Medicaid could threaten these costly programs that support our most fragile children, because they are optional programs. He could not substantively answer any of my questions—like where the number 330,000 came from. During that phone call I felt as though the floor dropped out below me. In that moment, I knew that the people who were representing my daughter in our nation’s capital had no understanding of the supports that kept her alive. There was no understanding, and clearly, no desire to understand. I met Antonio Delgado for the first time just a few days before the primary elections. I was touring the campaign headquarters trying to get a sense of where the candidates stood on healthcare—and what they knew about Medicaid waivers. Although Antonio was out when I stopped by, he took time out of a busy pre-election schedule to find me where Esmé and I had stopped to have lunch after. He sat with us, listened to me as I told him about our story. He also interacted with my daughter, making her laugh with funny faces. And he heard me when I told him my fears. He heard me when I told him that, should he win, I would personally hold him responsible remaining aware of the complex issues around disability, Medicaid, and healthcare. He said, “Good.” And I knew he meant it. I knew that I was talking to a man who would seek out and listen to his constituents, rather than try to avoid them for as long as possible. This is the reason we have supported his candidacy, why we were in an ad for him, why we have shown up to as many events as Esmé’s health will allow. When the campaign asked us to attend the rally last week, I was particularly thrilled—and I hoped I’d have the opportunity to meet you and thank you, knowing your political history, knowing how your personal experiences have driven you toward working for what is good and right in our nation, knowing how all the fight in you is overflowing with compassion in a way that I understand viscerally. As I have worked with every ounce of myself these last almost eight years to protect my daughter in all the ways I have had to—keeping her safe from the seizures, to working with her in hopes of gaining one small skill after another, to finding those things that motivate her—like the Muppets and reading, to advocating for her services and care, to supporting medical research with my foundation…it has been these political battles that have taken the most out of me. It is exhausting to feel as though my daughter’s rights to basic safety, respect, and compassion have been called into question, repeatedly, openly, and without the kind of challenge such a thing should illicit in all of my fellow Americans. But I will remain in this fight. With everything I have, with the fierceness as well as the compassion and the vulnerability, because I believe that is how we are strongest. 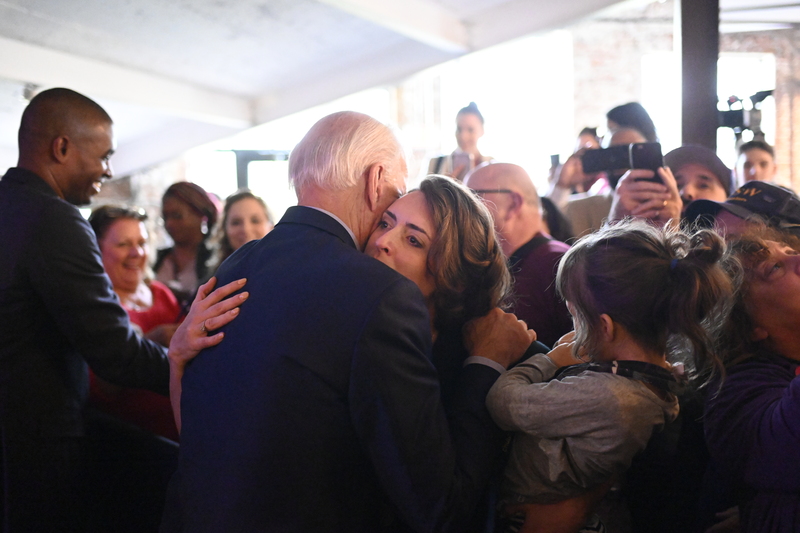 I have no idea where it will lead…but I am so happy it lead me to that room with my daughter in support of Antonio, to be able to have a heartfelt moment with you—where you made space for me and my daughter in a crowded room, where you passed along the words we need to go forward with hope. Thank you for that. And thank you for showing up to enthusiastically endorse the candidate who I know will listen, who I know will take the time to be with his constituents and learn from them, who I look forward to calling my congressman: Antonio Delgado.